While many vehicle owners do good jobs of avoiding accidents and keeping their vehicles in mint condition, there is just no way to keep tires and wheels away from roadways. As such, tires and wheels can and do come into contact with many roadway-centric hazards. These hazards can include things such as dangerous potholes, sharp curbs, and roadway debris. If and when vehicles traveling at any kind of speed hit these types of obstacles, the result is usually significant damage to tires, wheels, or both. Wheel damage can be especially hard to repair if the alloys involved in the collision lose their shape and ability to seal against tires. 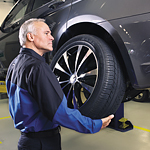 Similarly, tires that strike such obstructions can often sustain sidewall damages that preclude any form of repair. Luckily, the Chrysler Mopar Vehicle Protection Road Hazard Tire and Wheel Protection Plan offers several levels of coverage for drivers of Mopar certified vehicles. Drivers who enjoy this level of coverage get many valuable services that include deep discounts on full repairs, roadside assistance, and 0% deductibles during repair service visits.